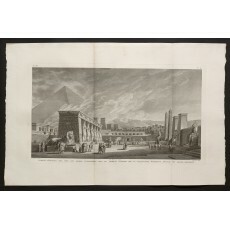 Voyage pittoresque de la Syrie, de la Phoenicie, de la Palestine, et de la basse Ægypte [title taken from wrapper of Première livraison]. i: (91) plates, numbered 1–3, 5–7, 9–10, 14–15, 18, 20–23, 23 bis, 24, 26, 27, 28, 30, 31, 33, 35–38, 41–42, 45, 53–55, 57–58, 65–68, 71, 74–75, 77, 79–81, 84–87, 89–91, 93–94, 98–99, 101–102, 104–106, 108–109, 109 bis, 110–114, 116–118, 118 bis, 119–127, 127 [i.e. 127 bis], 128–129, 131–132, 134–135, 137, of which thirteen folding (nos. 24, 26–28, 30–31, 33, 38, 53, 58, 68, 71, 91) and the others full-page. without text (see below); a printed bifolium (paginated 1–4) with above caption title and headings ‘Première Livraison, composée de six planches’ and ‘Explication provisoire de chacune des six Planches’, is the only letterpress present. ii: (31) plates, numbered 1, 3–4, 15–17, 27–30, 34, 54, 56–57, 59, 61, 64, 67–69, 76–80, 82, 85, 87, 91, 94, 96, of which seven double-page or folding (nos. 3, 4, 15–17, 30, 96) and the others full-page. Plus duplicates of plates 15 and 69.
iii: (56) plates, numbered 2–4, 6, 8, 9, 14, 19–25, 29–30, 32–36, 38, 40, 41, 43, 46–47, 52–55, 58, 63, 65–66, 69, 74, 76–77, 81–82, 87–88, 89, 91–92, 95–99, 101–102, 104–106, of which eight folding (nos. 8, 19–20, 58, 81, 91, 97–98) and the others full-page. Plus duplicates of plates 104, 105, and 106. An untrimmed copy, with minor wear along some sheet edges; occasional spotting in margins, other­wise in fine state of preservation. preserved in a modern cloth box. Fine set of this uncompleted work documenting ancient sites and scenes from daily life observed during the author’s travels in 1785–1787 through the Ottoman Empire. The French Revolution disrupted their project: when Choiseul-Gouffier refused to obey the Conven­tion, his goods in France were seized, and he fled from Constantinople to Russia, where he became Director of the Academy of Arts and Imperial Public Library. Cassas thus lost not only his patron, but also the author who was to write the text for his Voyage pittoresque. 1. Annie Gilet, ‘Le Voyage pittoresque de la Syrie, de la Phénicie, de la Palestine et de la Basse Égypte de Louis-François Cassas (dessinateur)’ in Miroirs de l’altérité et Voyages au Proche-Orient, Colloque international de l’Institut d’Histoire et des Civilisations Françaises de l’Université de Haifa, 1987 (Geneva 1991), pp.211–221; Annie Gilet, ‘Louis-François Cassas und der Orient’ in Europa und der Orient, 800–1900, catalogue of an exhibition held at the Martin-Gropius-Bau, Berlin, edited by Gereon Sievernich and Hendrik Budde (Gütersloh 1989), pp.279–287; Louis-François Cassas, 1756–1827: dessinateur-voyageur = Louis-François Cassas, 1756–1827: Im Banne der Sphinx: ein französischer Zeichner reist nach Italien und in den Orient, catalogue of an exhibition held at the Musée des Beaux-Arts, Tours, and at the Wallraf-Richartz-Museum, Graphische Sammlung, Köln (Mainz 1994). 2. Cf. Magazin encyclopédique ou Journal des sciences, des lettres et des arts, edited by A.L. Millin (Paris 1798), iv, pp.135–144 (extract p.141). 3. Cf. Bibliothèque nationale, Inventaire du fonds français. Graveurs du dix-huitième siècle, edited by Marcel Roux (Paris 1933), ii, p.29 no. 83 (Bacquoy), pp.348–351 nos. 10–28 (Benoist), pp.413–416 nos. 330–342 (Berthault); idem (Paris 1940), iv, pp.49–50 nos. 120–121 (Cathelin), etc. 4. Egyptomania: Egypt in western art, 1730–1930, catalogue of an exhibition organised by and held at the Musée du Louvre, the National Gallery of Canada, Ottawa, and the Kunsthistorisches Museum, Vienna, 1994–1995 (Ottawa 1994), pp.164–165 no. 88: ‘Cassas issued thirty separate instalments comprising 173 of the 330 plates originally intended’. 5. The prospectus is found in British Library, R.599 (14); Victoria & Albert Museum, Prints & Draw­ings Study Room, 106.B.28–29. 6. André Monglond, La France révolutionnaire et impériale: annales de bibliographie méthodique et description des livres illustrés, iv (Paris 1935), cols. 993–1005, listing thirty livraisons and the subjects of the plates (but not plate numbers). According to Monglond’s description and calculations, a com­plete copy contains 78 pages of text (7 + 8 + 8 + 15 + 12 + 20 + 8 pp.) and 180 plates (30 livraisons × 6 plates). 7. ● British Library, 149. i. 9 (540 × 350 mm), in a modern library binding. text Première livraison: (4) ff. signed 1–22 and paginated 1–7 (1); iie livraison: (4) ff. signed 1–22 and paginated 1–8; iiie livrai­son: (4) ff. signed 1–22 and paginated 1–8; ive livraison: (8) ff. signed 12 12 22 22 and paginated 1–15 (1); ve livraison: (6) ff. signed 1–32 and paginated 1–12; vie livraison: (10) ff. signed 1–52 and pagi­nated 1–20; viie livraison: (4) ff. signed 1–22 and paginated 1–8. On p.8, the suspension of publication is announced (‘Avertissement relatif à la huitième Livraison’). plates (lettered and numbered) Volume i: 90 plates, numbered 1 (‘Abord de la ville d’Alexandrette’), 2–3, 6, 7, 9, 10, 14–16, 20–23, 23 bis, 24, 26, 27, 28, 30, 31, 33, 35–37, 38, 41–42, 45, 53, 54–55, 57, 58, 65–67, 68, 71, 74–75, 77, 79, 80–81, 84–87, 89–90, 91, 93–94, 98–99, 101–102, 104–106, 108–109, 109 bis, 110–114, 116–118, 118 bis, 119–127, [127 bis], 128–129, 131–132, 134–135, 137. Volume ii: 34 plates, numbered 1, 3, 4, 5, 15, 16, 17, 27–29, 30, 34, 47, 54, 56–57, 59, 61–62, 64, 67–69, 76–80, 82, 85, 87, 91, 94, 96. Volume iii: 56 plates, numbered 2–4, 6, 8, 9, 14, 19, 20, 21, 22, 23, 24, 25, 29, 30, 32, 33, 34–36, 38, 40, 41, 43, 46, 47, 52–55, 58, 63, 65, 66, 69, 74, 76, 77, 81, 82, 87, 88, 89, 91, 92, 95, 96, 97, 98, 99, 101, 102, 104, 105, 106. 8. ● Sotheby’s, ‘The library of Henry Myron Blackmer ii, sold by order of the executor’, London, 12 October 1989, lot 455 (plates before letters). See also ● Sotheby’s, London, 7 June 1999, lot 181 (517 × 335 mm, 180 plates) ● Sotheby’s, London, 13 November 2008, lot 70 (650 × 470 mm, 180 plates). 9. ● Sotheby’s, ‘The Ottoman world: the library of Şefik E. Atabey with a supplement’, Sotheby’s, London, 28 May 2002, lot 201 (527 × 327 mm, 179 plates) ● Sotheby’s, 23 March 1999, lot 45 (183 plates, allegedly all those in the Blackmer and British Library copies, plus plates numbered 57 and 58 in volume i [these however are listed by Blackmer! ], 24 bis in volume iii). 10. Los Angeles, Getty Research Institute, Collection Number: 840011. 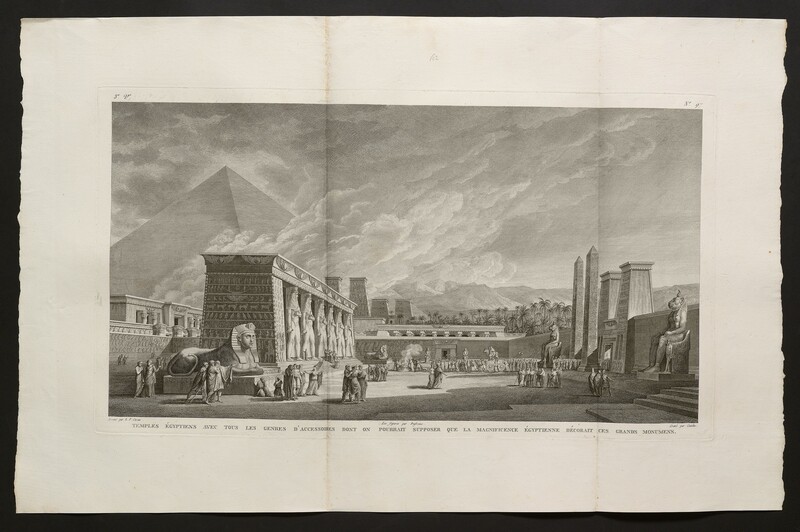 See on-line finding aid for ‘Louis François Cassas Materials for Voyage pittoresque de la Syrie, de la Phoénicie, de la Palaestine, et la Basse Aegypte’ (prepared by Isabella Zuralski, March 2006; link).